We are so appreciative of all the players who support us both financially through buying our Pickleball Rocks brand of shirts, hats and other promotional items, as well as helping us with housing, food and your forever-lasting friendships when we are out there on the tournament trail. Several years ago, we were able to get a registered trademark for “Pickleball Rocks” and that was the single most exciting event in our pickleball lives. It allowed our family to actually band together and form a legitimate business (All About Pickleball, LLC) which today takes us all across the country helping pickleball communities expand and grow. Today is another one of those truly exciting moments in time for the Pickleball Rocks team as we announce the addition of Stephanie Lane to the team. Stephanie is one of the most popular and respected pickleball players on the planet and we are so pleased to have her on our family’s team. As the newest member of the Pickleball Rocks team, Stephanie will be leading the fast-growing Pickleball Club Wear division of our parent company, All About Pickleball, LLC. When communities get pickleball started, those groups of pickleball players just naturally form teams and clubs, and one of the most fun things to do is to get matching shirts. What has happened is that many clubs have now begun looking to our Pickleball Rocks team to help them fill that need. Our problem is that we can’t keep up with all the new clubs popping up everywhere, hence the need to add someone to lead and manage our club shirt division. Stephanie will be the perfect go-to person to help clubs get the perfect shirts to fit their club’s look and personality. People will love working with her. 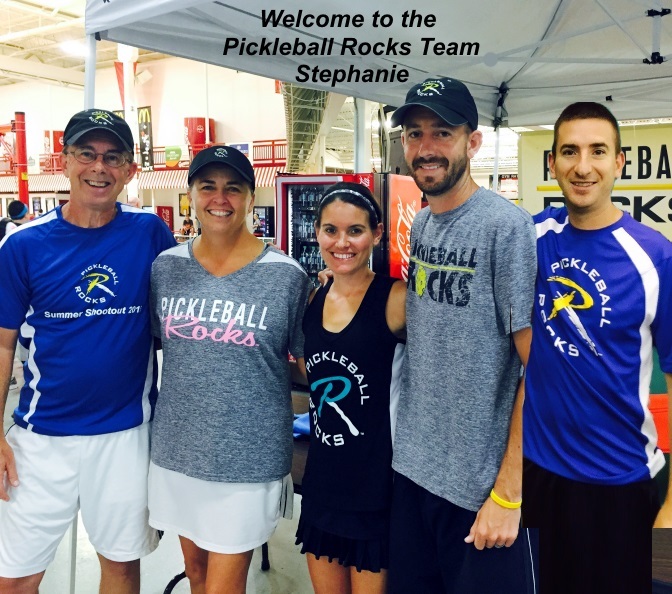 Welcome to the Pickleball Rocks Team Stephanie. When it comes to those people who are championing the sport of pickleball, Chris Allen and The Pickleball Show are right up there at the top. Chris and I had a great conversation recently and it was so much fun chatting about this great sport. And thanks to Chris for the shout out for the upcoming USAPA Great Lakes Regional pickleball tournament in Fort Wayne. Hope to see everyone there. Chris Allen and The Pickleball Show ROCKS!